Instruction: Donations accepted, not required to sign. steelerfan23	 06-28-2018 Pending - 2/0 Sent a picture and a blank index card. jupitersailfish	 03-05-2018 Pending - 1/0 Sending 1 card with SASE. Panthermatt	 02-28-2018 Pending - 1/0 Sent 1989 Pro Set coach card. Donhutson	 11-24-2017 10-06-2018 Success 316 2/2 sent mini and card. must of been one of the last he did before he got ill (or so ive heard) as both say 2017 on them. sent back my donation. 34BoJackson16	 11-04-2017 12-01-2017 Success 27 2/2 (2) 2012 Limited Jersey Cards. Both signed nicely with HOF Inscription! Sharkhunters75	 10-24-2017 11-02-2017 Success 9 2/4 4 of 2. Two adressed to me, one in black, one in blue. Inscribed '55-'67 , HOF 73 and 2017. Included 1 of his own cards which he signed and inscribed 2017 and HOF 1973. Also sent a reprint letter which he addressed to me and signed. cuzndale	 10-05-2017 03-14-2019 Success 525 1/1 No longer signing - his daughter is helping him catch up past submissions (note my dates). Nothing new will be signed - please don't send him anything, he's overwhelmed. I feel bad for even writing to him. Redskins2124	 09-20-2017 10-06-2017 Success 16 1/1 Signed one in black Sharpie. Looks great! twinsfan83	 09-05-2017 09-19-2017 Success 14 1/2 Returned my 2017 Classics and included his own with inscription!!! Lightning88	 08-02-2017 09-14-2017 Success 43 3/3 Sent 3 cards from The Netherlands,Europe...Signed all 3 and added a note. Awesome return! Redskins2124	 06-29-2017 07-08-2017 Success 9 2/2 Sent two cards and both signed in black and a little note thanking me for the letter. RobHarrington	 06-12-2017 06-22-2017 Success 10 1/1 1989 Pro Set signed in black Sharpie. spikeowen	 06-01-2017 06-13-2017 Success 12 2/2 2x 89PS - signed both and offered to send my boys each a personalized autographed picture. 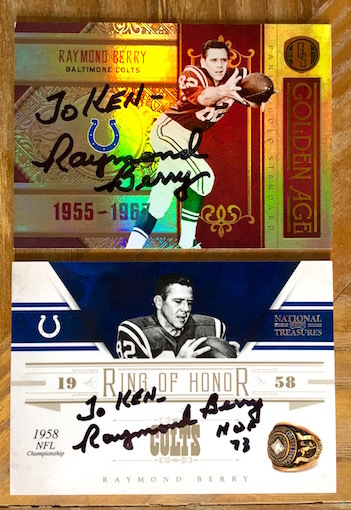 None kinder, Mr. Berry, you are a class act! cthom13	 05-15-2017 05-24-2017 Success 9 1/1 Awesome return. IC signed and personalized as well. ClevelandSports	 05-05-2017 05-15-2017 Success 10 1/4 By far my best return! Sent 1 IC, returned my IC signed with HOF Inscription, also signed 1 card plus his signed testimonial, and answered questions! alabamagator925	 05-03-2017 05-16-2017 Success 13 2/3 Well, this was unexpected. Not only did he sign my card but he wrote an almost 3 page letter in response to mine and included a signed testimony as well. I will write a response to his now. What a guy! Sten5123	 04-03-2017 04-10-2017 Success 7 3/5 Wow what an amazing guy! 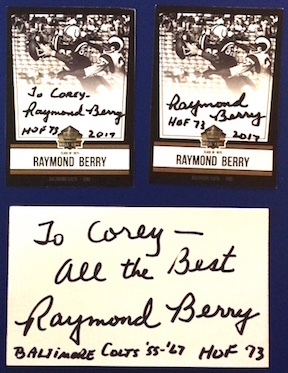 Mr. Berry signed all 4×6 photos, testimonial card, and signed letter with an invitation to lunch if I was ever in his neck of the woods! 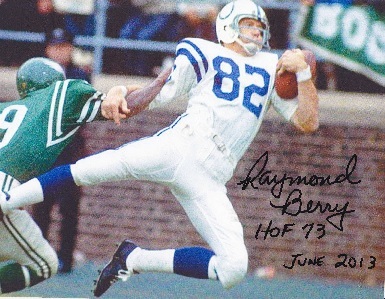 Thank you Mr. Berry! grapher0315	 03-17-2017 03-23-2017 Success 6 3/5 Sent 3 cards, lor, sase and sharpie. He signed all three cards, his testimonial, and a handwritten letter thanking me . What a gentleman!!! MikeyNH	 02-10-2017 02-18-2017 Success 8 2/4 Sent Raymond Berry a custom picture and questions. He signed my custom picture, answered questions, and also sent his testimonial card with his signature on it. 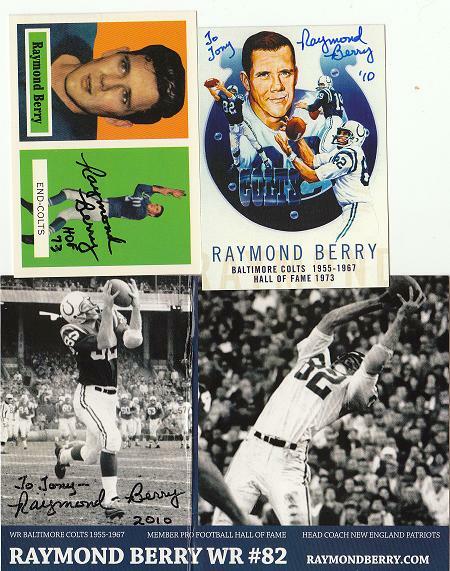 heffyscards	 01-28-2017 02-04-2017 Success 7 2/2 Signed 2 cards ,Thanks Raymond! Foul Bunt	 01-09-2017 01-20-2017 Success 11 1/2 Signed my 2008 Donruss Sports Legends and sent a signed testimonial. SyxxSynse	 01-09-2017 01-21-2017 Success 12 1/2 Sending base for future custom figure. Also received signed testimonial. 11 days. Thanks, Mr. Berry! 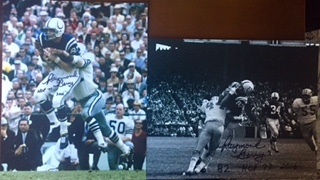 skinsfan832	 01-06-2017 01-17-2017 Success 11 1/2 One signed 4x6 inscribed with HOF, Hand written thank you note included! Thanks Mr. Berry! bostonfan16	 12-27-2016 01-10-2017 Success 14 1/3 Sent a 4 x 6 photo to be signed. Received my photo back signed, a handwritten letter thanking me for my support and included signed testimonial card. Also wrote another separate note on the back of my SASE. Restau21	 10-29-2016 12-14-2016 Success 46 1/1 Best return of all. Several 3x5 cards and great signature. 1956WS	 09-05-2016 09-15-2016 Success 10 2/2 Asked me for a donation to Fellowship of Christian Athletes which I will do. He's a bit of a genealogy hobbyist. Wrote out my ancestry for him. 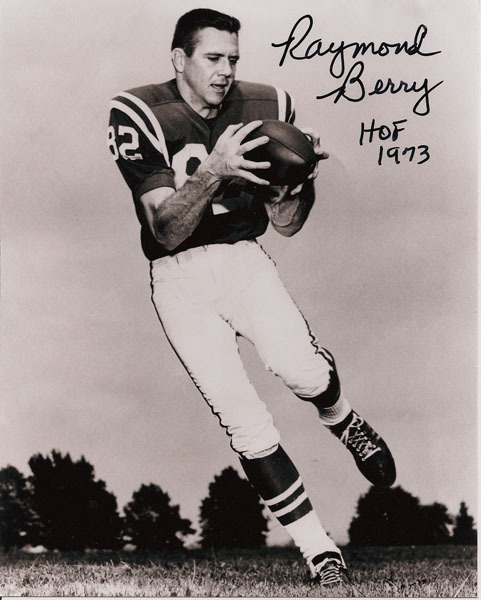 Thank you, Mr. Berry! wvu_class_of_2001	 05-11-2016 05-28-2016 Success 17 2/3 I'd ready great things about Mr. Berry and he didn't disappoint. Thank you, sir! 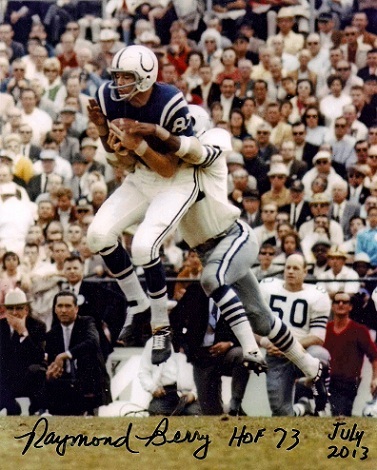 crbaughn62	 04-16-2016 04-25-2016 Success 9 1/1 inscribed 'HOF 73, baltimore colts 1955-1967, and #82'. also ask about origin our my last name. weird. CubsPackersOilers	 01-06-2016 03-11-2016 Success 65 1/1 signed 8x10. kar256	 12-30-2015 01-08-2016 Success 9 1/2 Personalized Post Card and Testimonial really cool package! flutie13	 12-02-2015 12-14-2015 Success 12 1/4 I was super excited to get mine back and the extras were a treat. One of them had a little message to me on the back of it. Class act all the way. 34BoJackson16	 11-17-2015 11-27-2015 Success 10 1/2 (1) 2001 Topps Archives RC Reprint Refractor. Returned inscribed and also asked me for the origin of my last name & sent a SASE for my reply. Awesome gentleman!!! Hobey21	 11-13-2015 11-21-2015 Success 8 1/3 Signed my white filler card and included his own mini card and news article about him. All signed and personalized! He is truly a great man! 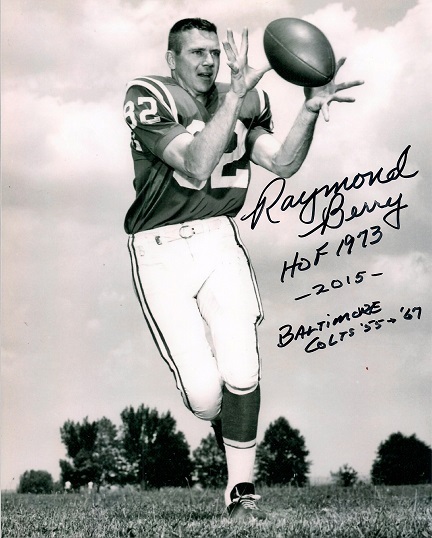 Thank you Mr. Berry! 2nd time getting him! 8 Days! TalleyHog34	 11-07-2015 11-16-2015 Success 9 1/3 Sent LOR with SASE and card. Great return! Included two extras. Thank you mr berry! Hobey21	 10-07-2015 10-26-2015 Success 19 1/3 Signed a 4x6 and included a black and white signed 4x6 and a color signed card! Great success from a great player! Thank you Mr. Berry! 19 Days! 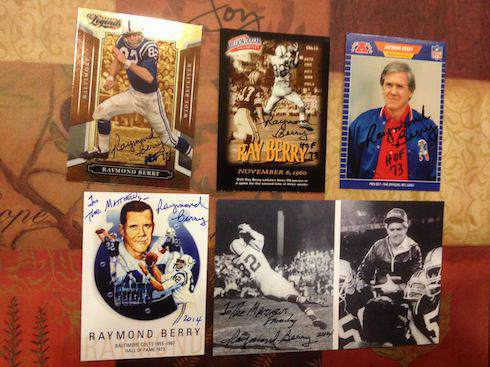 MDASCards	 09-15-2015 09-22-2015 Success 7 1/3 Thanks so much Mr. Berry. Included two extras. Also wrote me a note asking the origin of my last name and sent his own SASE. Awesome, going to respond back soon! 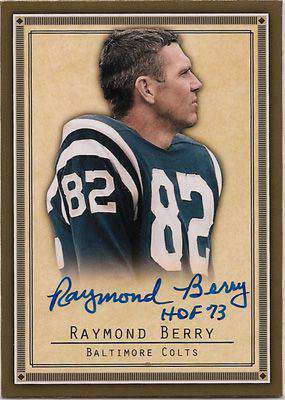 SyxxSynse	 08-29-2015 09-08-2015 Success 10 1/3 2000 Fleer Greats of the Game card. 10 days. 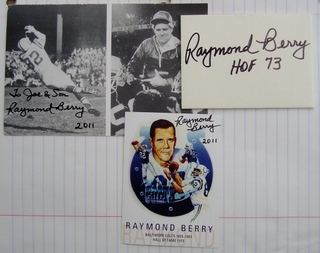 Inscribed "HOF 1973" on card and also sent personalized Testimony card and other personalized card thanking me for my letter. Very nice return! Thanks, Mr. Berry! 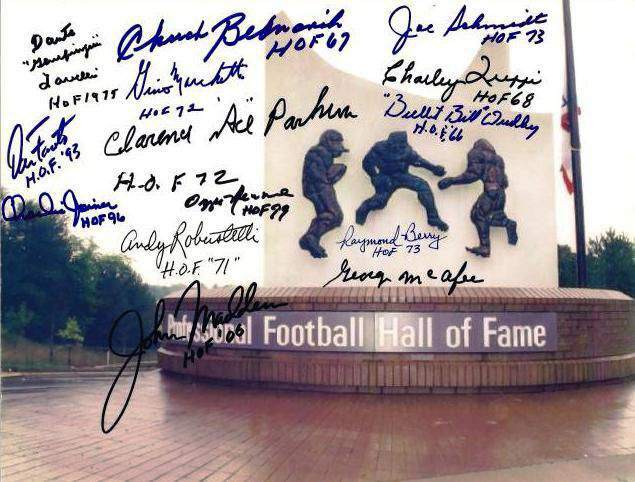 xxmikekooxx	 08-22-2015 09-01-2015 Success 10 4/12 Sent 4 8x10's got them all signed with HOF inscription. Plus threw in 3 cards and 2 small photos. Thanks Raymond!!! NotreDame	 08-18-2015 08-28-2015 Success 10 1/1 Sent 8x10 and added a card of his. Thanks Mr. Berry! BSRice	 07-24-2015 08-01-2015 Success 8 1/2 Send my card + included HOF inscription. He added his own postcard which was signed / personalized and included a short note. Saint On Sundays	 06-23-2015 07-18-2015 Success 25 1/1 Signed one gumball helmet. 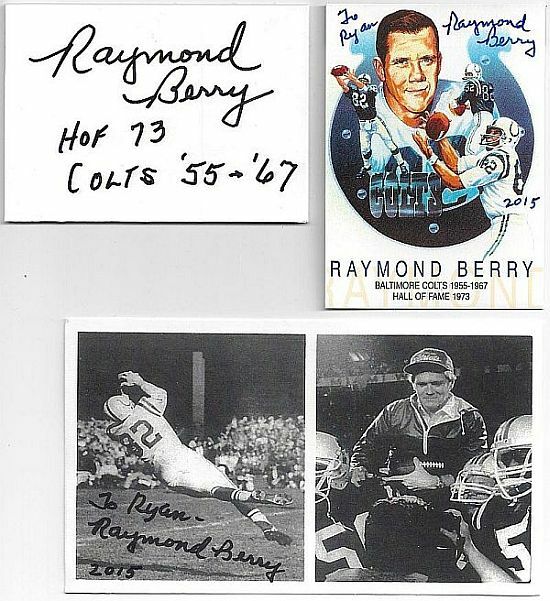 Inscribed "HOF" and "Baltimore Colts"
49erbud	 05-09-2015 06-05-2015 Success 27 1/1 He signed my 8x10 and also sent sum items of his own. Wrote me a note too. He seems like a really nice guy!! 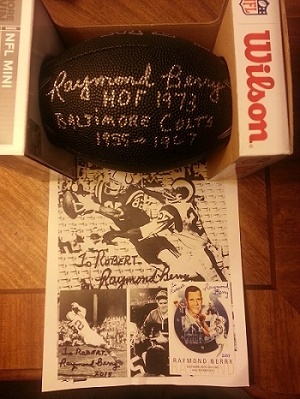 robbob1984	 05-02-2015 05-11-2015 Success 9 1/4 Signed my Mini Black Football also added some extra's. Thanks Raymond such a nice guy and a great success. RW22	 05-01-2015 05-25-2015 Success 24 1/5 Sent 8x10, returned signed along with a few other cards. This guy is really nice! 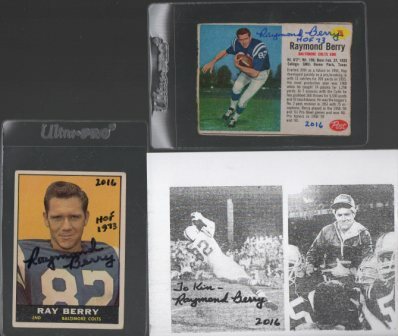 BBonds25	 04-25-2015 05-02-2015 Success 7 1/5 signed my 97 Ud legends, and sent his own card, 2 pictures, and my IC, all personalized w/ inscriptions. Also sent a note asking for my son's name's so he can send them personalized pictures. What a great guy! Saint On Sundays	 04-18-2015 05-01-2015 Success 13 5/8 Signed all 5 of my 4X6's in black sharpie with HOF inscription. 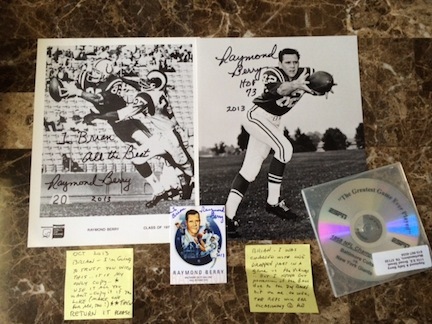 Also sent a signed card, and another signed 4x6 photo, AND a signed 8x10 HOF enshrinee. WOW! t23lee	 01-10-2015 01-17-2015 Success 7 0/4 requested for one, sent me two cards and two pictures personalized! Thanks!! copaantl98	 01-08-2015 02-13-2015 Success 36 2/4 Sent two cards. Received 2 extras of his own back. All signed in blue. Thanked me for my letter! bickel84	 01-10-2014 02-21-2015 Success 407 1/3 Great success! Took a little over 13 months. Received my 1964 Philadelphia signed. Also received a custom card signed and a signed photo. 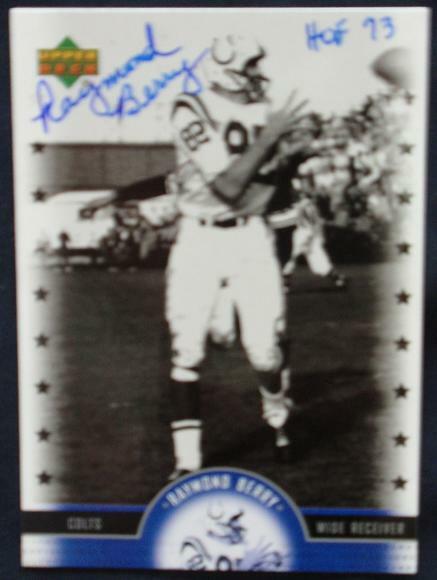 mazefan72	 11-05-2013 11-23-2013 Success 18 3/6 Signed the two 8x10s I sent to him along with a custom auto card. 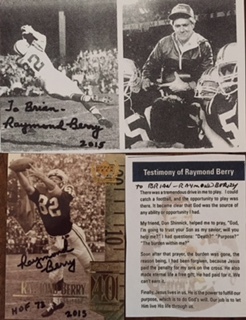 Mr. Berry included an additional 8x10, along with his testimonial card, and a split stock 3x5 photo, he even added .27 cents extra for shipping. 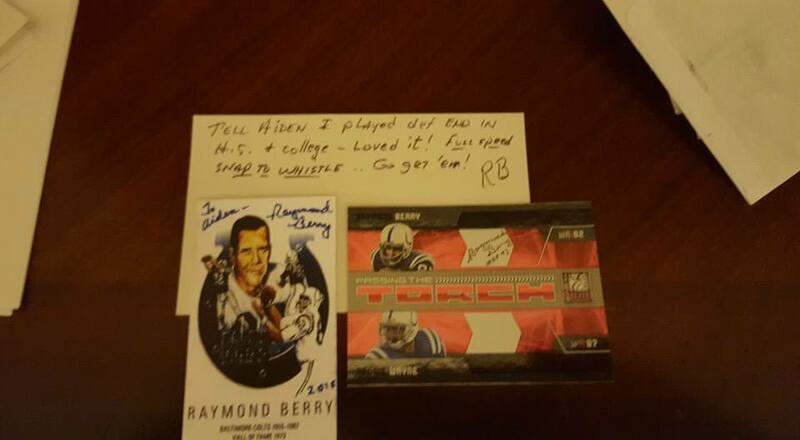 Class act all the way TY Mr. Berry. jaymz887	 10-09-2013 10-18-2013 Success 9 1/3 send 1 card and $5. said i was getting autographs to have something to pass down to my son. he signed my card. sent a signed testimonial and returned the $5 sent a note he said "for your sons birthday". awesome man. Noles25	 10-01-2013 10-05-2013 Success 4 1/3 Sent 1 8x10, received 2 signed 8x10s, a signed testimony card, 2 hand written notes and his copy of the Greatest Game Ever Played. WOW!!! Class Act. Took 4 days. 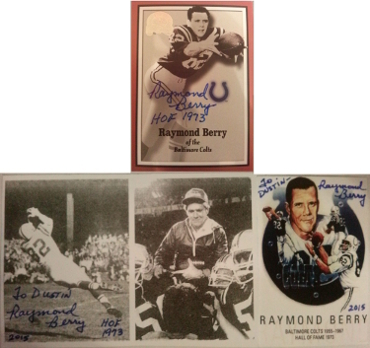 bigsportsfan1	 09-11-2013 09-18-2013 Success 7 1/3 Signed my mini helmet and added 2 other signed items, thanks Raymond! tigerfan84	 08-02-2013 08-14-2013 Success 12 2/4 Signed my two 5x7s with HOF inscription. Added 2 more of his own. theRaineman	 07-01-2013 07-31-2013 Success 30 3/7 awesome return! signed my items and sent a book, 8x10, and testimony card! One of the top acts out there! jace44	 06-20-2013 06-27-2013 Success 7 2/6 Signed 8x10, index card and added 4 more! Great ttmer! bigsportsfan1	 06-17-2013 06-26-2013 Success 9 1/4 . Signed my picture and added 3 other signed items. Thanks Raymond! Coltron57	 11-12-2012 12-01-2012 Success 19 1/4 1 index card. Incredible return, got my index card back, plus 2 trading cards and a photo card all signed. wolfman4christ	 10-07-2012 11-02-2012 Success 26 1/4 Signed the card I sent, a 2005 Upper Deck Legends?, a testimony card and a 3x5 or 4x6 picture. Thanks Mr. Berry. Riggs	 07-03-2012 07-23-2012 Failure 20 1/0 sent mini helmet, $15. sent all back unsigned with note saying " also wrote april 2011" IF YOU HAVE EVER GOTTEN A RETURN, DONT SEND AGAIN UNLESS U ARE PAYING $30! bcommerce	 04-13-2012 05-07-2012 Failure 24 3/0 I had already sent 2 cards about 4 months ago as they noted on a post it note. I did send under my sons name this time, thought it would be neat for him to get some mail too, bad Idea they think I am selling them. Needs $30 to sign anymore. emc23	 01-14-2012 01-27-2012 Success 13 1/1 Signed & personalized mini helmet. Included his own autographed card as well. GoWarrior	 12-05-2011 01-27-2012 Success 53 1/5 Sent 8x10. 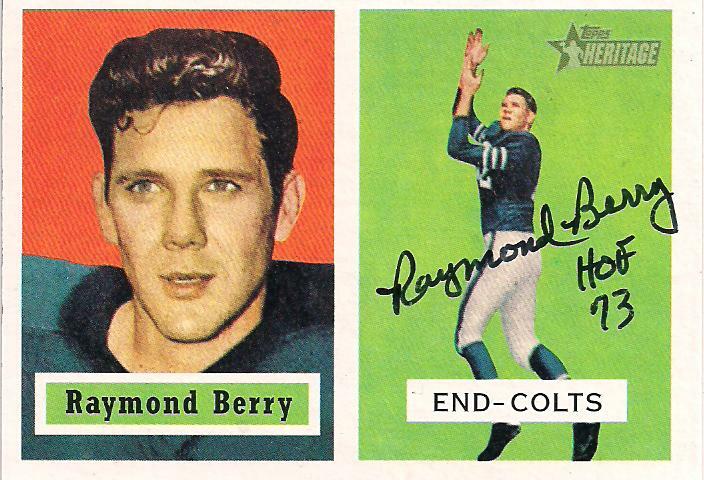 Returned signed with 58-59 NFL champs inscrip as requested. Also included additional 8x10, postcard, custom card, and DVD promo sheet, all signed and inscribed. Wrote note about how nice my letter was. I guess it counts... amazing return! Colts15	 11-17-2011 01-28-2012 Success 72 0/7 sent a request for 2 8x10s and added $2, finally got them back and 2 4x6s, 2 cards and a letter. thought they were goners, that's why I sent another thing. kyleEMT	 10-22-2011 11-03-2011 Success 12 1/3 My picture messed up in the mail a little but he signed it and sent two of his own...favorite ttm so far!! mattingly4232	 09-16-2011 10-31-2011 Success 45 1/3 Wow, what a great signer and kind man. signed my black and white 8x10 in silver, personalized, and added a picture signed and personalized as well as a testimonial card signed and personalized. 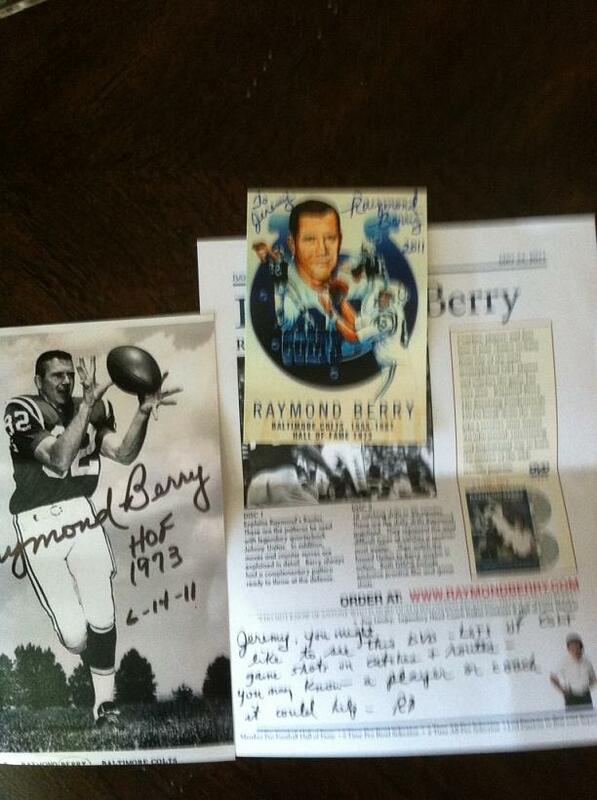 CLASS ACT, Thank you Mr. Berry! 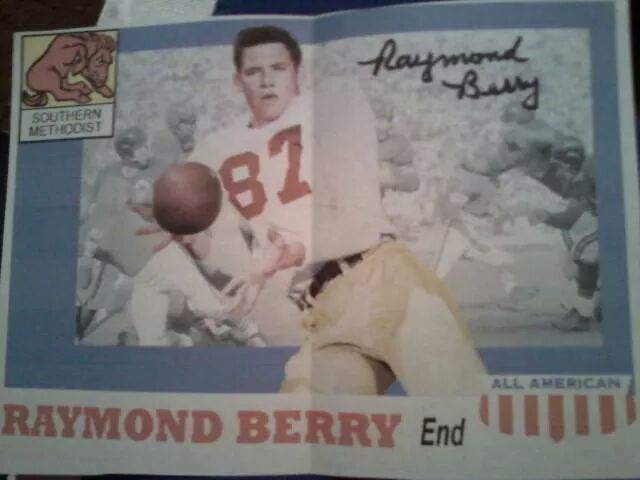 Csarge8	 07-30-2011 08-24-2011 Success 25 3/8 What a man.. My girls sent Mr. Berry 2 ICs and a filler, he signed both PLUS 2 cards, frito lay pats head coach 5 X7, and 2 additional 5 X 7s all autographed.. Amazing man..
REDANDGOLDPRIDE	 07-21-2011 08-22-2011 Success 32 2/5 Signed my 8x10 & 97 UD Legends, added some other stuff plus an 8x10 of his own. Thanks a ton Ray. O'sRavensDevils	 07-12-2011 08-24-2011 Success 43 2/3 Sent 2 cards, received both back and an additional card, all signed in blue sharpie! Jeremy_Falcons	 06-08-2011 06-16-2011 Success 8 1/3 I sent him a photo and he signed it. He included a couple of extras as well. Great guy. lizard-jd	 06-03-2011 06-09-2011 Success 6 1/4 Signed my custom 8x10 & sent 3 other signed cards with a nice note. lilstovie34	 06-01-2011 01-26-2012 Success 239 1/4 Signed my 8x10, 2 ICs and a custom card of his. Awesome! RedsFanatic21	 05-23-2011 06-03-2011 Success 11 1/4 Sent IC, received signed 8x10, card, IC and dvd flyer. Also answered my questions! Jeremy_Falcons	 04-15-2011 04-29-2011 Success 14 1/3 He signed my inxex card and sent a signed card and flyer. Great response! Great guy! Riggs	 04-01-2011 06-06-2011 Success 66 1/2 Great signer, Very pleased about this return!! white2128	 01-01-2011 03-28-2011 Success 86 1/3 signed testimonial, signed 8x10, and signed dvd poster sheet. 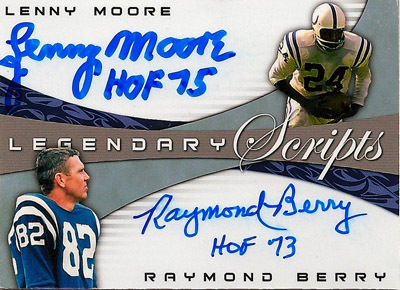 RockiesFan33	 12-21-2010 04-29-2011 Success 129 1/3 Sent custom previously signed by Lenny Moore. Sent back 2 additional signed items. garpike	 11-19-2010 03-26-2011 Success 127 1/5 Mr. Berry sent back a couple cards with mine and an ad for a DVD. 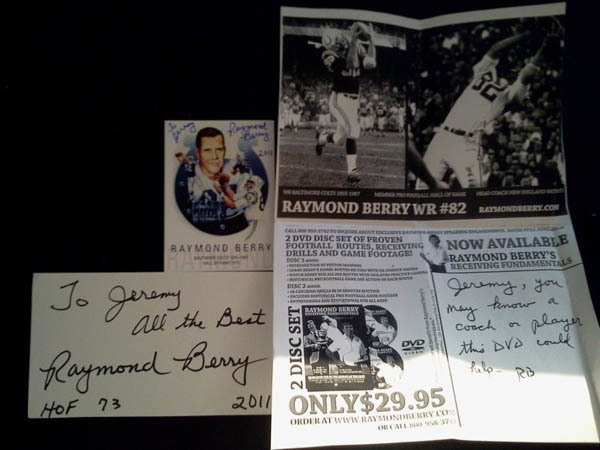 lambeauleap87	 09-27-2010 10-04-2010 Success 7 1/4 Signed My Card In Blue Sharpie, And Included Lots Of Other Goodies; Very Awesome From A True Legend! REDANDGOLDPRIDE	 08-30-2010 09-07-2010 Success 8 2/3 Sent custom, and questionnaire, he signed the custom, answered the questions, and sent his DVD flyer signed as well. Great guy! Boozler79	 08-09-2010 08-14-2010 Success 5 1/1 Sent 8x10,LOR & SASE. Rcvd my 8x10 signed. Great success from a great signer. brandon711	 06-14-2010 06-21-2010 Success 7 2/7 signed both cards plus both index cards. Added a 5x7 picture, another h.o.f. Card and a flyer for his dvd signed. A real nice sig almost looks like a females handwritin it's so clean and neat. skinsfan0521	 06-02-2010 06-19-2010 Success 17 0/4 Sent LOR - Received 8x10, 2 smaller postcards & a flyer for his DVD signed. Also answered my questions and wrote a LOT! Awesome success from a great HOF! 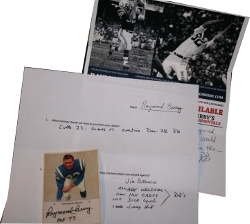 coltsfan6418	 05-25-2010 06-01-2010 Success 7 2/4 Sent a HOF Panphlet and a Card. Got back those 2 items as well as another card and a personalized letter on a flyer for his DVD. Great Guy! RockiesFan33	 05-20-2010 06-04-2010 Success 15 1/1 Signed my custom. REDANDGOLDPRIDE	 04-02-2010 04-13-2010 Success 11 1/4 Signed custom, included two signed photos, and an additional card. All personalized, awesome guy. PONCHO	 03-31-2010 04-10-2010 Success 10 1/3 Signed my card H.O.F.and sent 1 of his own cards and a post card. First class athlete. 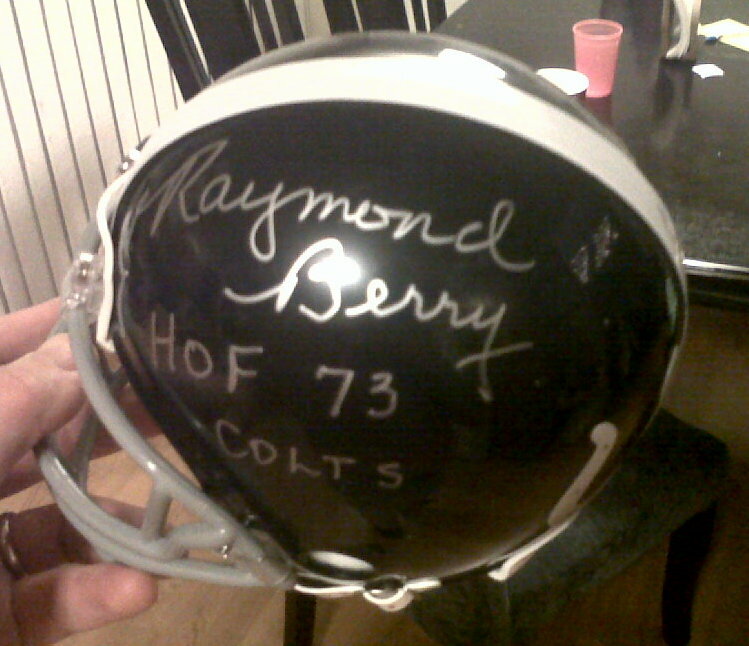 Thank you Mr. Berry. RockiesFan33	 03-23-2010 04-01-2010 Success 9 1/4 Signed my 8x10. Included a bunch of other signed items. Riggs	 03-22-2010 03-27-2010 Success 5 1/2 sent one, got 2 back.. Great HOF success. never thought i would see this so quik!!! MaydayMalone4MVP	 02-05-2010 03-29-2010 Success 52 1/3 signed my 06 Leaf Limited & added a nice signed card of his own, also signed a letter that has his dvd's for sale. A class act!! 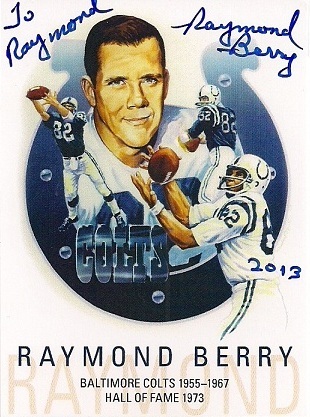 coltsfan	 01-15-2010 03-29-2010 Success 73 1/3 signed topps card in blue sharpie and sent two other items signed in blue. Thanks Ray! bronxbomber	 01-14-2010 01-30-2010 Success 16 1/3 Great return. Sent 2 of his own personalized. booger184	 11-07-2009 11-16-2009 Success 9 2/4 Sent 2 customs! Amazing guy sent a 5x7 but bent and sent his own Testimonial card AMAZING GUY! Cmwill24	 07-22-2009 08-17-2009 Success 26 1/1 Signed 1/1 football card. Also sent 2 other signed cards. RunClintonRun	 06-12-2009 06-22-2009 Success 10 2/3 Signed card and football texture IC. Added his own signed & personalized bible card. Wmdeitrick	 01-14-2009 01-20-2009 Success 6 1/1 sent 8X10, lor, sase, signed w/inscriptionS and sent note and sase for me to answer a few questions. great man! primetime27	 10-09-2013 02-26-2015 Failure 505 0/0 02 26 15 Sent another request. Email bounced back. Panthermatt	 09-17-2018 Pending - 1/0 Sent a 1989 coach card.